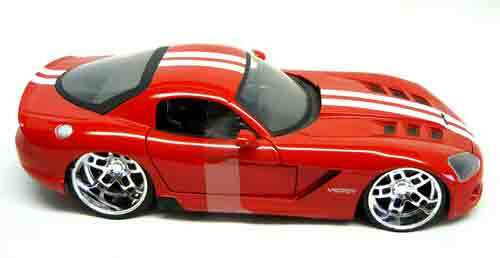 Jada Big Time Muscle has come out with a 2008 Dodge Viper SRT10. Of course it has the usual excellent Jada detailing. The hood opens to reveal an excellently detailed and chromed red engine. The hatch back and both doors open. This model is free wheeling with Jade Dub City wheels. Approximate dimensions are 7.75” long x 3.25” Wide x 2.25” high. 1.5 lbs.